Bangkok pavement clean-up takes on a new phase with the tearing down of stalls along Maharaj Road near Tha Chang Plaza. 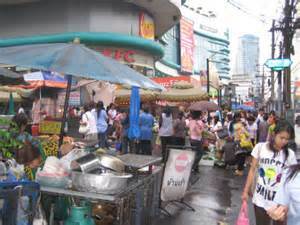 Will Bangkok be a better or worse place if the street stalls are cleared away? Opinion seems to be greatly divided on this one but whatever your thoughts the hustle & bustle of a street market remains one of Bangkok’s most iconic sights. I truly believe that the great Big Mango would lose a part of her soul if they cleared all the vendors from the streets. Bangkok City workers clear away the remains of torn down stalls and garbage at the Tha Chang plaza yesterday as part of the “landscape improvement” operation re-regulating the footpath along Maharaj Road from Tha Chang to Tha Phrachan. The next target to undergo a similar operation, possibly in January, will be the Bang Lamphu area, followed by Pak Klong Talad a month or two later, according to the Bangkok governor’s adviser Pol Maj-General Wichai Sangprapai.